On Thursday, September 17th, Recovery Café tuned in to the White House for Recovery Month! We hosted a viewing party of the online webcast put on by the Office of National Drug Control Policy in celebration of Recovery Month, while also hosting a voter registration drive. 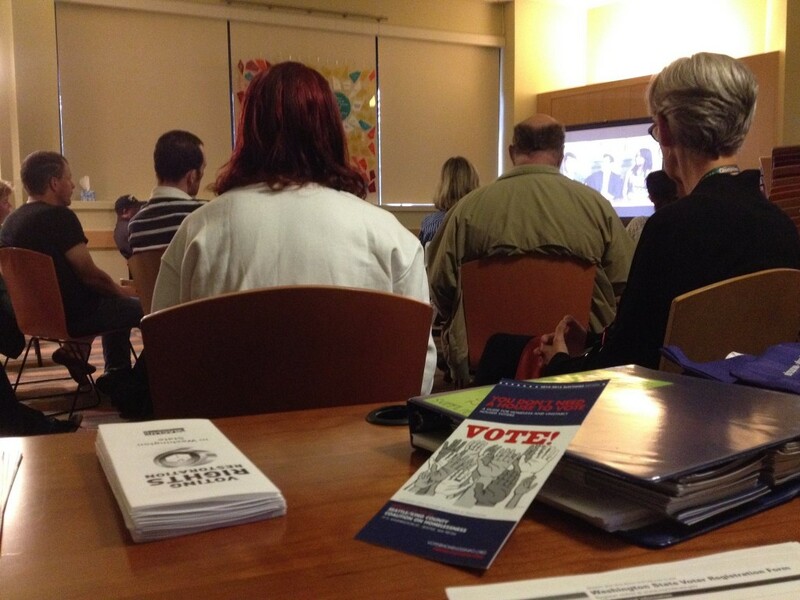 During this event, Recovery Café registered three Members to vote! The webcast included an introduction by the Drug Czar, Michael Botticelli, followed by a panel of young adults in recovery. The panelists shared stories of success, times of discouragement, glimpses of hope, and moments of vulnerability. About 25 Recovery Café Members and visitors listened intently to what the panelists in Washington, DC had to say. While the webcast did have a special focus on young people in recovery, the audience at Recovery Café was able to relate to the journey of recovery that progresses throughout one’s life. The panelists concluded their webcast by inviting the audience to share their stories of recovery with another person. What had been a quiet and focused room for the previous hour exploded into conversation. A long-time Member with years in recovery turned to a staff member and began sharing his story of depression, addiction, and turn to hope that was sustained by his involvement at Recovery Café. At the Café, we are so fortunate to have the loving community to turn to for support in time of celebration and vulnerability, and excited to join the on-going conversation across the nation.